Tips for Speeding Up Your Web Site is a Big But Easy to Understand List Which Are Definite Ways To Make Any WordPress Website Load Faster. We have published many articles on Page Speed Optimization, also, we will consider them in this article. Currently we are giving importance to Yahoo’s recommendations – which are Gold Standard throughout the World. In real life, today, none uses a very slow Internet connection, all tests are done taking the users speed is medium. Practical fact for understanding Tips for Speeding Up Your Web Site is that – on browser a website in real life can seem to load faster than the other, despite they have the exact score and time of visually being complete. We only look at few elements of a webpage while it is first loading – we do not see upper fold of a webpage. Google’s tips and methodologies are not taken in to standard as their major need directly conflicts with W3C’s recommendations. Facebook, for example is one of the best example of optimized backend. 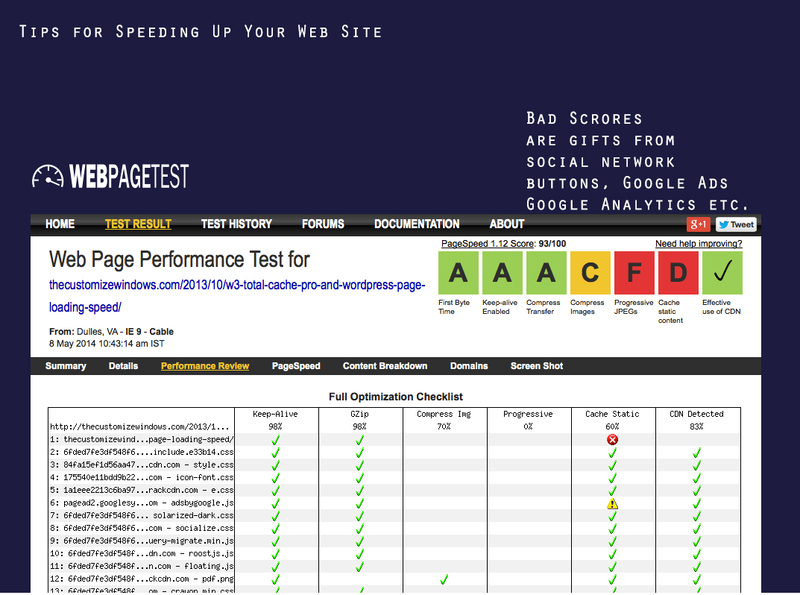 Without a good backend score over 91/100 on webpagetest.org is never possible to achieve. Minimize HTTP Requests, take that most of the visitors has no browser cache. You should not think about the repeat view. Use Base64 URI Encoding for images, if not possible, use image sprites. Base64 URI Encoding makes the things more easier. Use mod_deflate for Apache 2.x. Use a load balancer, enable caching by load balancer and set DNS cache to maximum possible. iPhone caches, but iPhone won’t cache components bigger than 25K. Searching our website can give gratifying result. Host is important – only few are good. This Article Has Been Shared 2886 Times! Cite this article as: Abhishek Ghosh, "Tips for Speeding Up Your Web Site," in The Customize Windows, May 8, 2014, April 18, 2019, https://thecustomizewindows.com/2014/05/tips-speeding-web-site/.